The European Economic Community (EEC) was founded on this date in 1957. The EEC was a regional organization which aimed to bring about economic integration among its six member states. It was created by the Treaty of Rome of 1957. 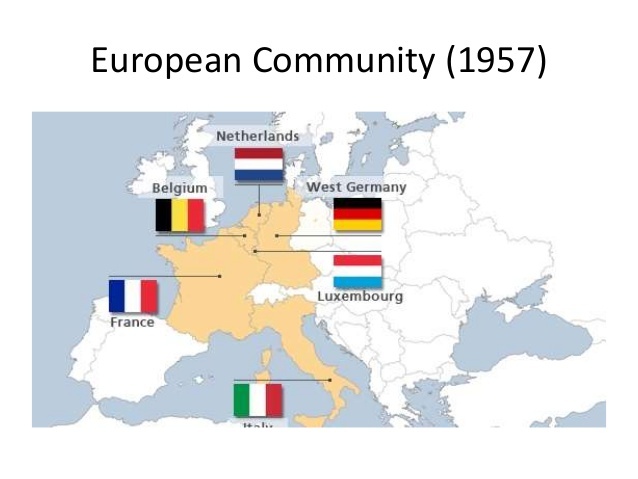 Upon the formation of the European Union (EU) in 1993, the EEC was incorporated and renamed the European Community (EC). In 2009 the EC’s institutions were absorbed into the EU’s wider framework and the community ceased to exist. Given the current state of affairs with the UK on the verge of leaving the EU, I thought it might be worthwhile to look back on how it all started. The Community’s initial aim was to bring about economic integration, including a common market and customs union, among its six founding members: Belgium, France, Italy, Luxembourg, the Netherlands and West Germany. It gained a common set of institutions along with the European Coal and Steel Community (ECSC) and the European Atomic Energy Community (EURATOM) as one of the European Communities under the 1965 Merger Treaty (Treaty of Brussels). In 1993, a complete single market was achieved, known as the internal market, which allowed for the free movement of goods, capital, services, and people within the EEC. In 1994, the internal market was formalized by the EEA agreement. This agreement also extended the internal market to include most of the member states of the European Free Trade Association, forming the European Economic Area covering 15 countries. 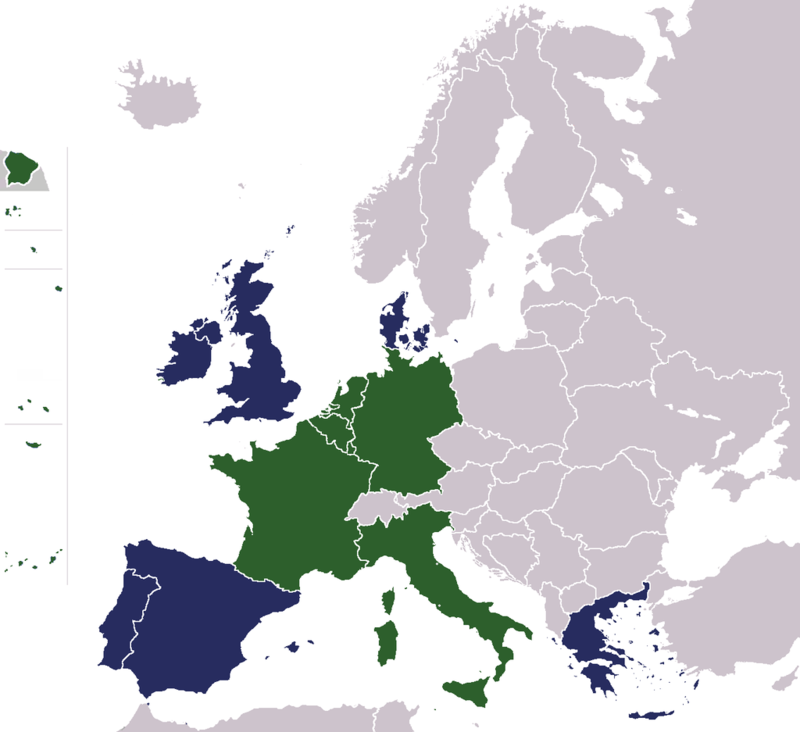 Upon the entry into force of the Maastricht Treaty in 1993, the EEC was renamed the European Community to reflect that it covered a wider range than economic policy. This was also when the three European Communities, including the EC, were collectively made to constitute the first of the three pillars of the European Union, which the treaty also founded. The EC existed in this form until it was abolished by the 2009 Treaty of Lisbon, which incorporated the EC’s institutions into the EU’s wider framework and provided that the EU would “replace and succeed the European Community”. The EEC was also known as the Common Market in English-speaking countries and sometimes referred to as the European Community even before it was officially renamed as such in 1993. 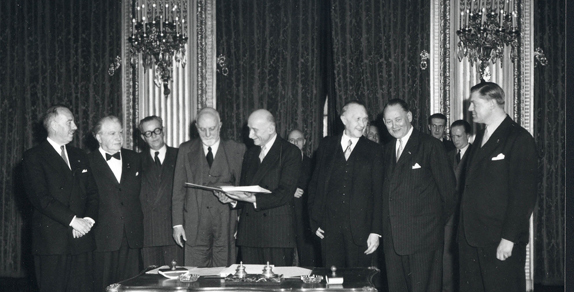 In 1951, the Treaty of Paris was signed, creating the European Coal and Steel Community (ECSC). This was an international community based on supranationalism and international law, designed to help the economy of Europe and prevent future war by integrating its members. In the aim of creating a federal Europe two further communities were proposed: a European Defence Community and a European Political Community. While the treaty for the latter was being drawn up by the Common Assembly, the ECSC parliamentary chamber, the proposed defense community was rejected by the French Parliament. ECSC President Jean Monnet, a leading figure behind the communities, resigned from the High Authority in protest and began work on alternative communities, based on economic integration rather than political integration. After the Messina Conference in 1955, Paul Henri Spaak was given the task of preparing a report on the idea of a customs union. The so-called Spaak Report of the Spaak Committee formed the cornerstone of the intergovernmental negotiations at Val Duchesse conference centre in 1956. Together with the Ohlin Report the Spaak Report would provide the basis for the Treaty of Rome. In 1956, Paul Henri Spaak led the Intergovernmental Conference on the Common Market and Euratom at the Val Duchesse conference centre, which prepared for the Treaty of Rome in 1957. The conference led to the signature, on 25th March 1957, of the Treaty of Rome establishing a European Economic Community. The resulting communities were the European Economic Community (EEC) and the European Atomic Energy Community (EURATOM or sometimes EAEC). These were markedly less supranational than the previous communities, due to protests from some countries that their sovereignty was being infringed. The first formal meeting of the Hallstein Commission was held on 16th January 1958 at the Chateau de Val-Duchesse. The EEC was to create a customs union while Euratom would promote co-operation in the nuclear power sphere. The EEC rapidly became the most important of these and expanded its activities. One of the first accomplishments of the EEC was the establishment (1962) of common price levels for agricultural products. 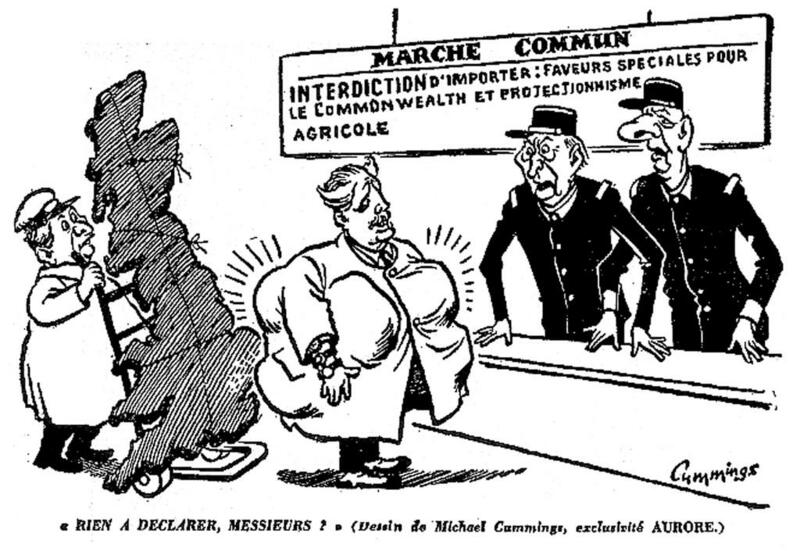 In 1968, internal tariffs (tariffs on trade between member nations) were removed on certain products. The 1960s saw the first attempts at enlargement. In 1961, Denmark, Ireland, Norway and the United Kingdom applied to join the three Communities. However, President Charles de Gaulle saw British membership as a Trojan horse for U.S. influence and vetoed membership, and the applications of all four countries were suspended. Greece became the first country to join the EC in 1961 as an associate member, however its membership was suspended in 1967 after the coup d’état of the Colonels. A year later, in February 1962, Spain attempted to join the European Communities. However, because Francoist Spain was not a democracy, all members rejected the request in 1964. The four countries resubmitted their applications on 11th May 1967 and with Georges Pompidou succeeding Charles de Gaulle as French president in 1969, the veto was lifted. 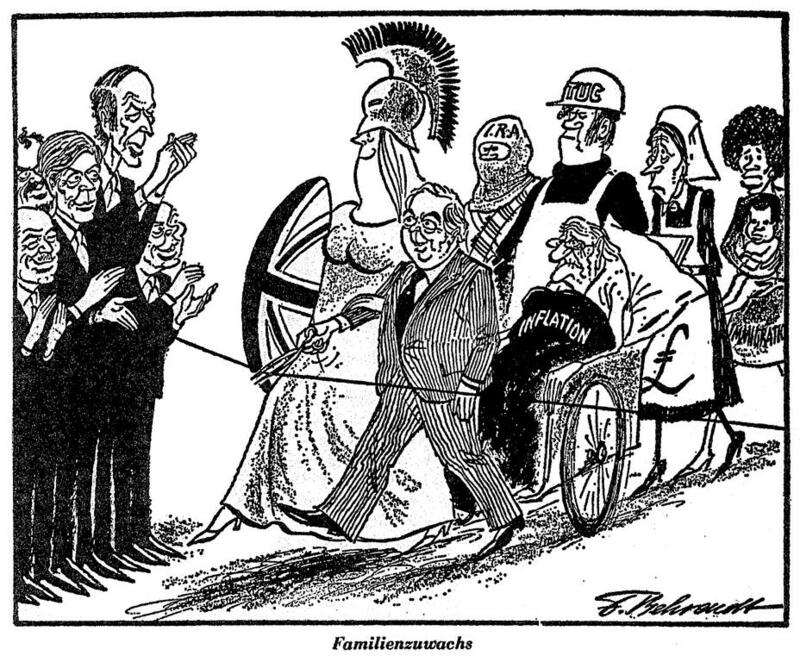 Negotiations began in 1970 under the pro-European government of Edward Heath, who had to deal with disagreements relating to the Common Agricultural Policy and the UK’s relationship with the Commonwealth of Nations. Nevertheless, two years later the accession treaties were signed so that Denmark, Ireland and the UK joined the Community effective 1st January 1973. The Norwegian people had finally rejected membership in a referendum on 25th September 1972. 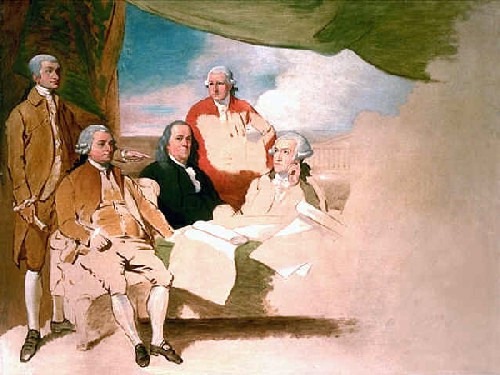 The Treaty of Paris which finalized the peace between Great Britain and the 13 North American colonies that became the United States, was signed in Paris by representatives of King George III of Great Britain and representatives of the United States of America on this date in 1783. Britain acknowledged the right of the United States to be sovereign and independent. The treaty also set the boundaries between the British Empire and the new country, and also included details such as fishing rights and the restoration of property and prisoners of war. The Treaty took over a year to settle because, as always, the devil is in the details. France and Spain also had a large stake in the establishment of boundaries at the time. Many things come to mind as I contemplate this treaty. First, this is not a date that means much any more in the US. Declaring independence on 4th July is a BIG DEAL – but WINNING independence has largely been forgotten except for a few vagrant (and mostly wrong) memories of Washington, Valley Forge, and “redcoats.” There were 7 years between declaring and winning independence. Even when the battles were over there was a lot to decide, and not a lot of agreement. 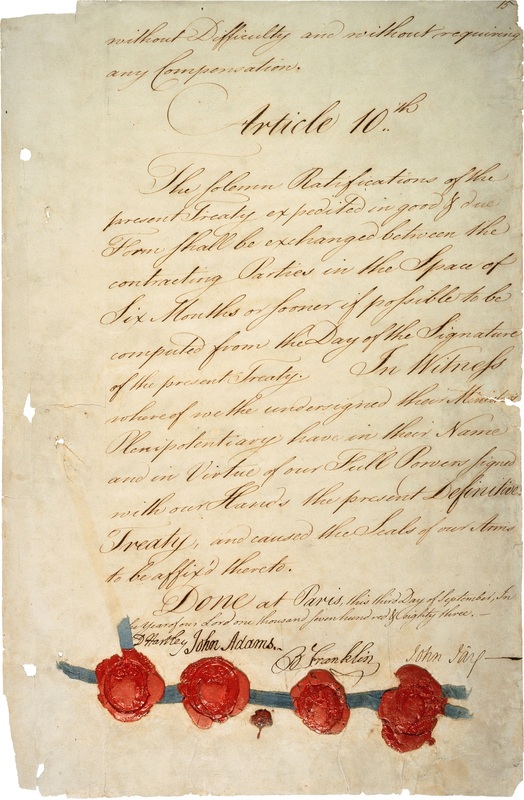 Second, after signing the treaty both sides set about ignoring the details, particularly with regard to boundaries, one of the key issues in the War of 1812, which people in the US often see as a Second War of Independence, whereas people in Britain see it as an extension of the Napoleonic Wars, if they think about it at all. 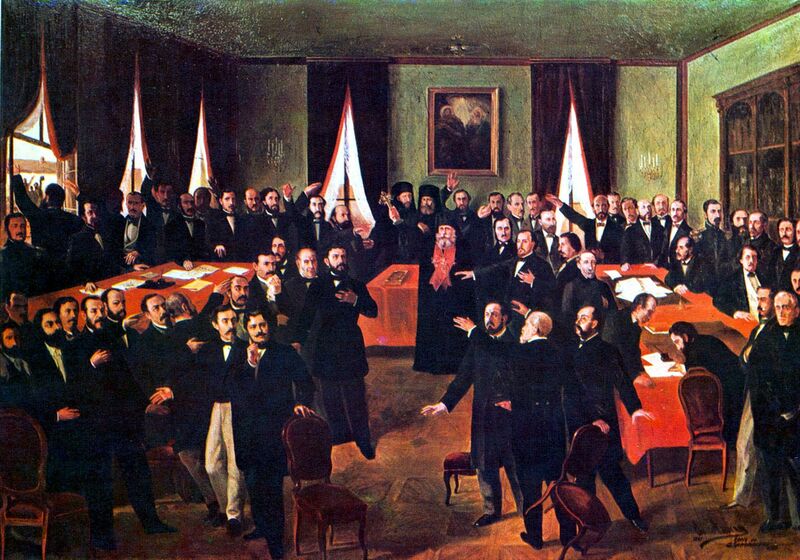 Peace negotiations began in April 1782, and continued through the summer. Representing the United States were Benjamin Franklin, John Jay, Henry Laurens, and John Adams. David Hartley and Richard Oswald represented Great Britain. The treaty was signed at the Hotel d’York (presently 56 Rue Jacob) in Paris on September 3, 1783, by Adams, Franklin, Jay, and Hartley. 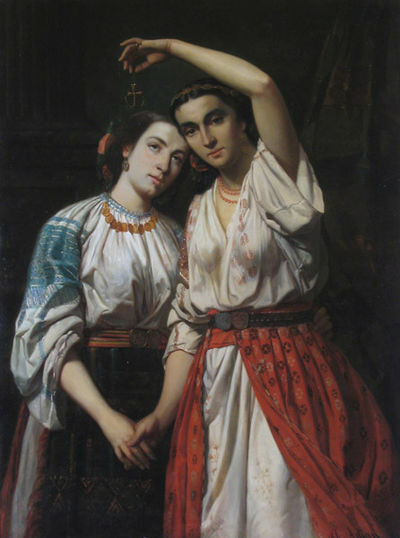 A contemporary artist attempted to record the events but the British representatives refused to sit, so the painting was left incomplete. The key episodes came in September, 1782, when the French Foreign Minister Vergennes proposed a solution that was strongly opposed by his ally the United States. 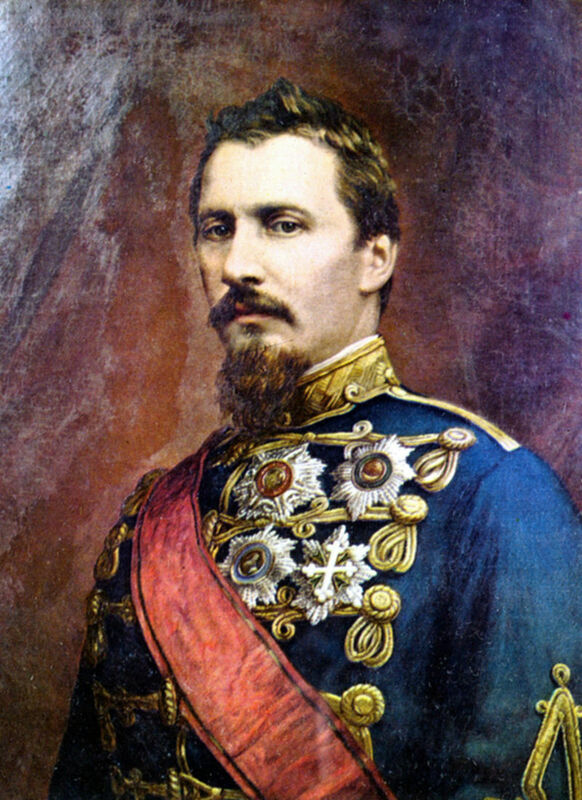 France was exhausted by the war, and everyone wanted peace except Spain, which insisted on continuing the war until it could capture Gibraltar from the British. Vergennes came up with the deal that Spain would accept instead of Gibraltar. The United States would gain its independence but be confined to the area east of the Appalachian Mountains. Britain would take the area north of the Ohio River. In the area south of that would be set up an independent Indian state under Spanish control. It would be an Indian buffer state. The Americans realized that they could get a better deal directly from London. John Jay promptly told the British that he was willing to negotiate directly with them, cutting off France and Spain. The British Prime Minister Lord Shelburne agreed. He was in full charge of the British negotiations and he now saw a chance to split the United States away from France and make the new country a valuable economic partner. In the west the United States would gain all of the area east of the Mississippi River, north of Florida, and south of Canada. 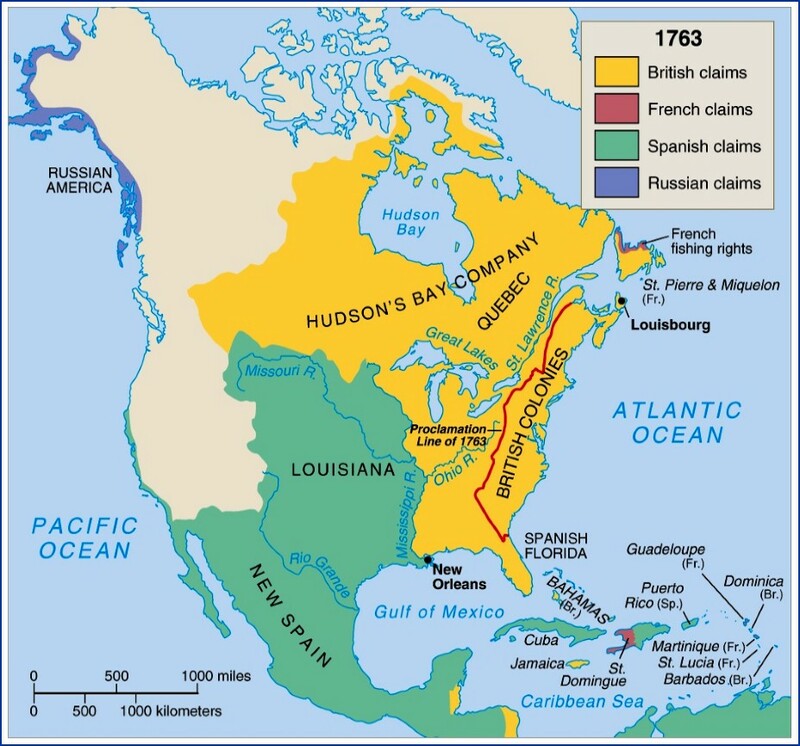 The northern boundary would be almost the same as today.The United States would gain fishing rights off Canadian coasts, and agreed to allow British merchants and Loyalists to try to recover their property. It was a highly favorable treaty for the United States, and deliberately so from the British point of view. Prime Minister Shelburne foresaw highly profitable two-way trade between Britain and the rapidly growing United States. Great Britain also signed separate agreements with France and Spain, and (provisionally) with the Netherlands. In the treaty with Spain, the territories of East and West Florida were ceded to Spain (without a clear northern boundary, resulting in a territorial dispute resolved by the Treaty of Madrid in 1795). Spain also received the island of Minorca. The Bahama Islands, Grenada, and Montserrat, captured by the French and Spanish, were returned to Britain. The treaty with France was mostly about exchanges of captured territory (France’s only net gains were the island of Tobago, and Senegal in Africa), but also reinforced earlier treaties, guaranteeing fishing rights off Newfoundland. Dutch possessions in the East Indies, captured in 1781, were returned by Britain to the Netherlands in exchange for trading privileges in the Dutch East Indies, by a treaty which was not finalized until 1784. Historians have often commented that the treaty was very generous to the United States in terms of greatly enlarged boundaries. Historians such as Alvord, Harlow, and Ritcheson have emphasized that British generosity was based on a statesmanlike vision of close economic ties between Britain and the United States. The concession of the vast trans-Appalachian region was designed to facilitate the growth of the North American population and create lucrative markets for British merchants, without any military or administrative costs to Britain. The point was the United States would become a major trading partner. The French foreign minister, Vergennes, later put it, “The English buy peace rather than make it”. Vermont was included within the boundaries because the state of New York insisted that Vermont was a part of New York, although Vermont was then under a government that considered Vermont not to be a part of the United States. Privileges that the North Americans had received from Britain automatically when they had colonial status (including protection from pirates in the Mediterranean Sea) were withdrawn. Individual states ignored federal recommendations, under Article 5, to restore confiscated Loyalist property, and also ignored Article 6 (e.g., by confiscating Loyalist property for “unpaid debts”). Some, notably Virginia, also defied Article 4 and maintained laws against payment of debts to British creditors. The British often ignored the provision of Article 7 about removal of slaves. The actual geography of North America turned out not to match the details used in the treaty. The Treaty specified a southern boundary for the United States, but the separate Anglo-Spanish agreement did not specify a northern boundary for Florida, and the Spanish government assumed that the boundary was the same as in the 1763 agreement by which they had first given their territory in Florida to Britain. While that West Florida Controversy continued, Spain used its new control of Florida to block US access to the Mississippi, in defiance of Article 8. 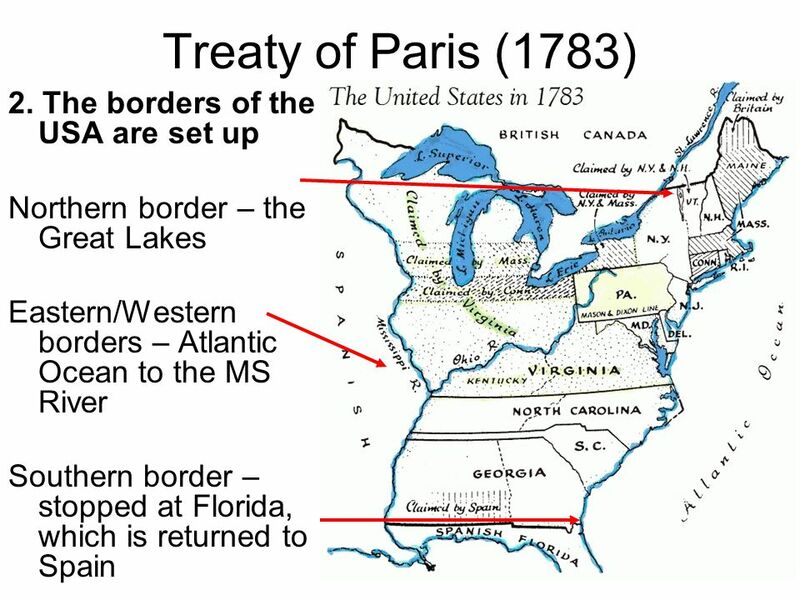 The treaty stated that the boundary of the United States extended from the center of the Lake of the Woods (now partly in Minnesota, partly in Manitoba, and partly in Ontario) directly westward until it reached the Mississippi River. But in fact the Mississippi does not extend that far northward. The line going west from the Lake of the Woods never intersects the river. In the Great Lakes region, Great Britain violated the treaty stipulation that they should relinquish control of forts in United States territory “with all convenient speed.” British troops remained stationed at a number of forts (Detroit, Lernoult, Michilimackinac, Niagara, Ontario, Oswegatchie, Presque Isle) for over a decade. The British also built an additional fort (Miami) during this time. They found justification for these actions in the unstable and extremely tense situation that existed in the area following the war, in the failure of the United States government to fulfill commitments made to compensate loyalists for their losses, and in the British need for time to liquidate various assets in the region. This matter was finally settled by the 1794 Jay Treaty. Virginia. The first wave of English immigrants began arriving in North America, settling mainly around Chesapeake Bay in Virginia and Maryland. The Virginian settlers were dominated by English noblemen with their servants (many were Cavaliers fleeing in the aftermath of the English Civil War 1642–51) and poor peasants from southern England. The society the Cavaliers brought with them was highly stratified and this was reflected in food and eating habits. The aristocrats that would be the basis for the First Families of Virginia were very fond of game and red meat. Roast beef was a particular favorite, and even when oysters and goose were available, wealthy colonists could complain about the absence of meat. Virginia was the only place in North America where haute cuisine of any kind was practiced before the 19th century. New England. New England was first settled beginning in 1620, and it was dominated by East Anglian Calvinists, better known as the Puritans. The religious fundamentalism of the Puritans created a cuisine that was austere, disdainful of feasting and with few embellishments. Though New England had a great abundance of wildlife and seafood, traditional East Anglian fare was preferred, even if it had to be made with New World ingredients. Baked beans and pease porridge were everyday fare, particularly during the winter, and usually eaten with coarse, dark bread. Delaware Valley. The Quakers emigrated to the New World from the Northern English Midlands during the 17th century, and eventually settled primarily in the Delaware Valley. They were similar to the Puritans in the strictness that they applied to everyday life, and their food was plain and simple. The most typical cooking method of the Quakers was boiling, a method brought from ancestral northern England. Boiled breakfast and dinner were standard fare, as well as “pop-robbins,” balls of batter made from flour and eggs boiled in milk. Boiled dumplings and puddings were so common in Quaker homes that they were referred to by outsiders as “Quakers’ food”. Travelers noted apple dumplings as an almost daily dish in the Delaware Valley and cook books specialized in puddings and dumplings. Food was mostly preserved through boiling, simmering or standing. A popular genre of dishes made from this favored method of food preparation was “cheese” (or “butter”), a generic term for dishes prepared by slow boiling or pressing. It could be made from ingredients as varying as apples (i.e., apple butter), plums and walnuts. 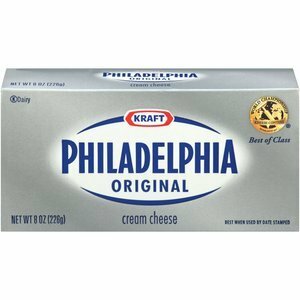 Cream cheese had its origins in Quaker cooking, but was in colonial times not true cheese made with rennet or curds, but rather cream that was warmed gently and then allowed to stand between cloth until it became semi-solid. Backcountry. The last major wave of British immigrants to the colonies took place from 1720–1775. About 250,000 people travelled across the Atlantic primarily to seek economic betterment and to escape hardships and famine. Most of these came from the borderlands of northern Britain and were of Scots-Irish or Scottish descent. Many were poor and therefore accustomed to hard times, setting them apart from the other major British immigrant groups. They settled in what would come to be known generally as the “Backcountry,” on the frontier and in the highlands in the north and south. The back country relied heavily on a diet based on porridge or mush made from soured milk or boiled grains, a diet that was despised in wealthier parts of the colonies as well as in Britain. 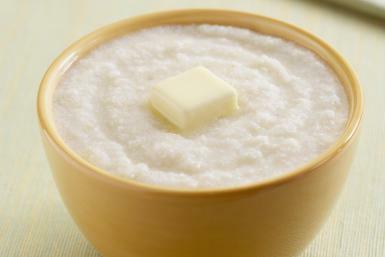 Oatmeal porridge was popular but eventually the oatmeal was replaced by corn, and became what is known in the South as grits. Cakes of unleavened dough baked on bake stones or circular griddles were common and went by names such as “clapbread,” “griddle cakes,” and “pancakes.” Rabbit, squirrel, and possum were common hunted meats. The Revolutionary War disrupted the diet a little, although historians differ concerning the extent. For example, wool was in great need for uniforms, so slaughtering sheep became uncommon, thus pig rearing increased in popularity for meat over lamb and mutton. Imported foods from Britain were banned, and had been highly taxed anyway. Coffee replaced tea as a hot drink, and whisky replaced rum because it could be distilled from corn instead of from sugar which was imported from the British West Indies. Colonists preferred eating barley over brewing beer with it, and, in any case, making alcoholic cider is simpler than brewing beer. What passes as “American” cuisine these days reflects these colonial realities. I’ll leave you to it, whether it be Boston baked beans, Philadelphia cream cheese, or grits.